The test allows to determine the IBU (level of bitterness of beer) , measuring the quantity of iso-ɑ-acids present in the wort or in the finished beer. The possibility to test IBU during the boiling phase or during fermentation allows to know the real responsiveness to the theoretical calculations and allows to supervise every production batch, ensuring a high quality standard. The traditional methods for measuring bitterness often requires a laboratory with a laboratory technician, UV/Vis spectrophotometer, water bath, glassware, solvents etc. and can take anywhere from 15 – 30 minutes. It uses the optimized EBC reference method. The IBU test can be performed directly at every step of the beer production process and so you have the possibility to study your recipe optimizing the additions of the hops and monitoring the actual extraction of the bitter. The test can be performed in approximately 6 or 7 minutes by anyone. 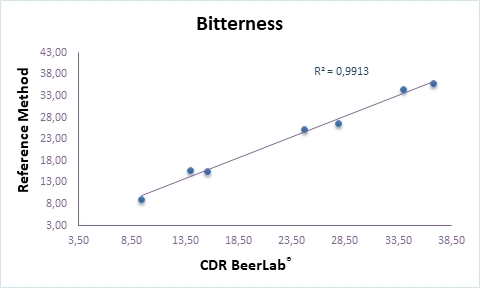 Bitterness levels can be measured using CDR BeerLab®, a system which enables you to carry out a wide panel of chemical analyses on beer and water, using a single instrument, in a process that is faster and simpler than traditional methods. Are possible test sessions with several samples, up to 16 for CDR BeerLab® and 3 tests for CDR BeerLab® Junior. Iso-ɑ-acids are extracted from beer through an appropriate solvent. After centrifugation the extract is read at 270 nm and the coloration is related to the degree of bitterness of the sample. Bitterness (IBU) was last modified: February 19th, 2019 by CDR s.r.l.